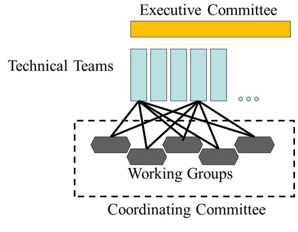 The organizational structure of the Quantitative Imaging Network is shown in this figure. The Executive Committee consists of the principal investigators from each research team and several program directors from the NCI Cancer Imaging Program. The Executive Committee has oversight of the network and actively meets by teleconference on a monthly basis. They establish guidelines on network interactions with professional societies, methods for data sharing, publication and promotion material for the network, and the conduct of tool challenges, to name just a few. Clinical Trial Design & Development: The mission of the clinical trial design and development working group of the Quantitative Imaging Network (QIN) is to develop, validate and harmonize methods and tools for use of quantitative imaging in cancer clinical trials for outcome prediction and tumor response to therapy. Bioinformatics/IT and Data Sharing: The mission of the Bioinformatics Working Group (BIWG) is to define the informatics requirements common to all QIN centers and to establish consensus standards that are generalizable and useful to the quantitative imaging community nationally. Such requirements include specifying the breadth of imaging biomarkers assessed computationally and semantically, defining common data representation and exchange standards to promote cancer. This working group has two subgroups actively pursuing interests in this area. One is an MRI subgroup and the other the PET/CT subgroup. Each brings special focus to the image analysis problems found in these to imaging methods. Communication among the working groups is needed to ensure minimal duplication of effort and to transmit progress across the network. A Coordinating Committee consisting of the chairs and co-chairs of the various working groups meets monthly by teleconference to exchange progress and ideas.